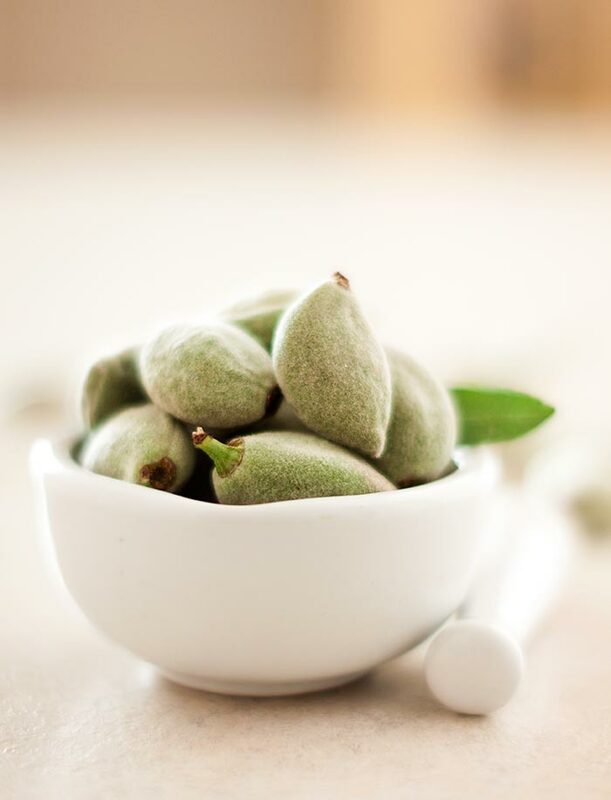 Green almonds have become one of our favorite spring treats and we’re constantly coming up with new ways to enjoy them. This simple relish, which pairs fresh, crunchy green almonds with mild, buttery Castelvetrano olives and fresh rosemary, could not possibly be any easier to make. It’s great with grilled pork chops, but it would be just as good with fish, on a salad or with a good creamy goat cheese. If you’re not in the mood for grilling (or the weather isn’t cooperating, you can simply sear the pork chops in a heavy-bottomed pan on the stovetop. Thick, juicy pork loin chops only need to be seared for a couple of minutes on each side to seal in the juices. Just finish them in a hot oven for an additional 15 minutes or so and they’re ready to be served. Preheat the grill to high. Brush the grate clean & oil well. Wash the almonds and pat dry. Slice off the tip of the end with the stem and discard. Slice the almonds into 1/8th inch thick pieces. Whack each olive with the flat of your hand or the back of a heavy knife until they crack open. Discard the pit and tear the olives in half or into large pieces. Place the sliced almonds and olives into a bowl and add the remaining ingredients. Toss well and set aside to stand at room temperature for 15 – 20 minutes. 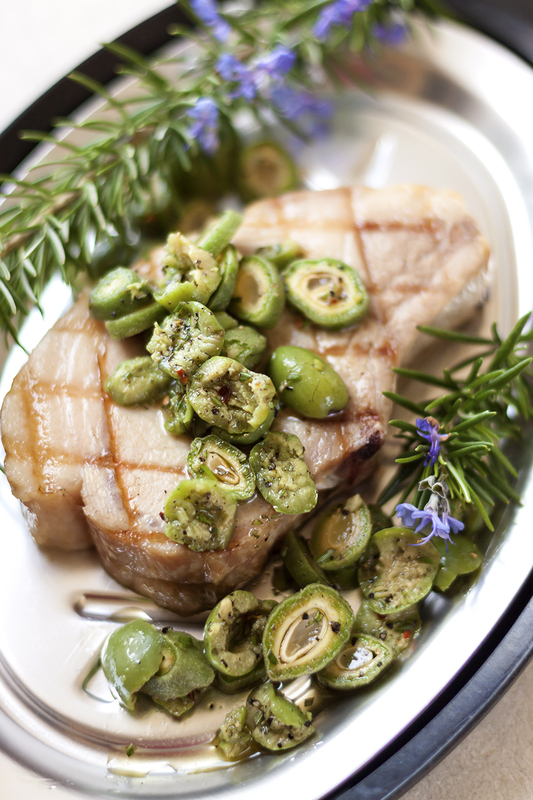 Brush the pork chops with a little olive oil to coat. When the grill is preheated, you’re ready to put on the chops. Sear them on a very hot grill (450 degrees F) for a minute or two on each side. Lower the heat to 225 degrees F and cook for 5 minutes. Turn the chops and cook for another 5 minutes. Remove from the grill to a plate and cover loosely with aluminum foil. Allow to rest for 10 minutes. When your chops are ready to serve, put each one on a plate and spoon the Green Almond and Olive Relish generously over the top. 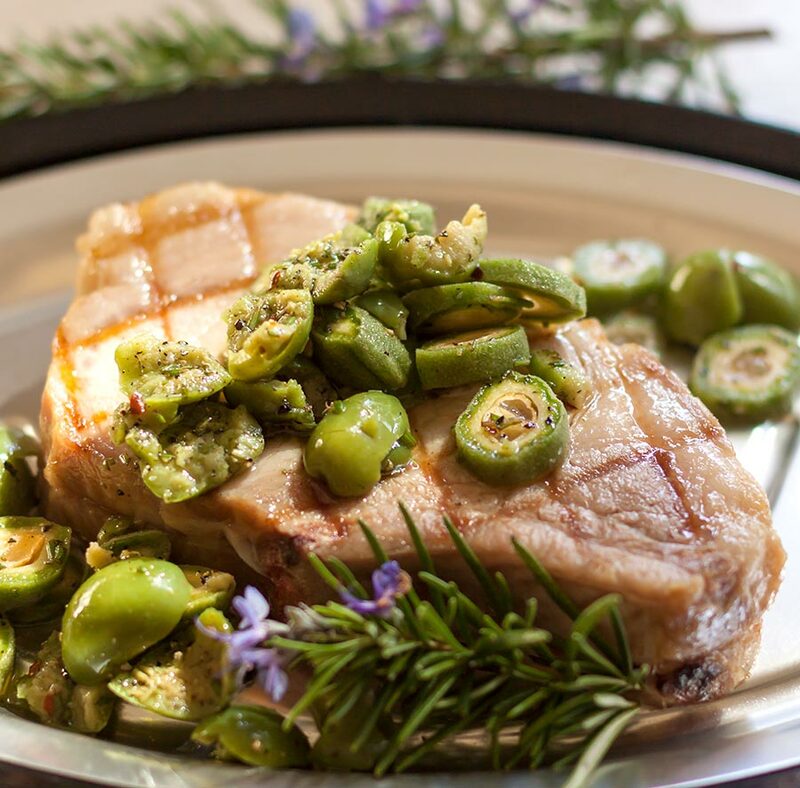 The rich, smoky flavor of the chops is perfectly complemented by the sweet, buttery olives, refreshingly tart and crunchy green almonds, and herbaceous notes of rosemary and fruity olive oil.